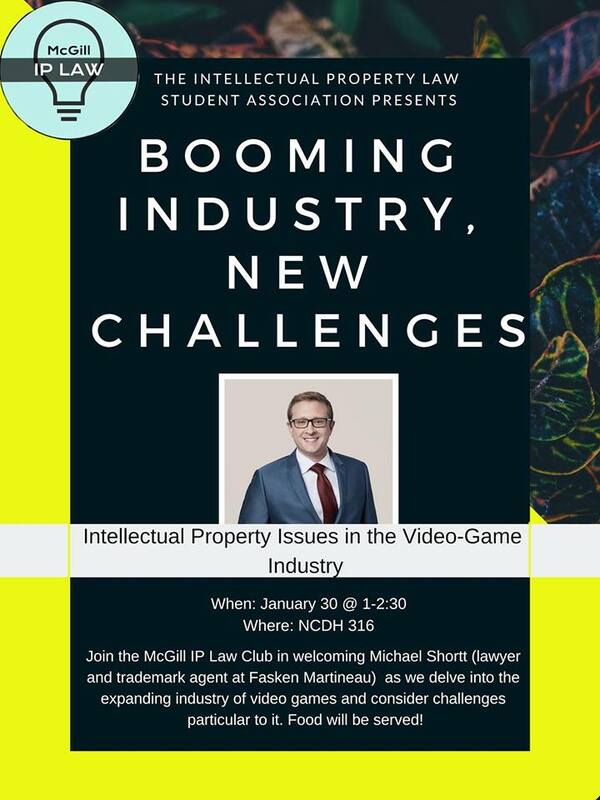 The IP Law Student Association is happy to invite students for an afternoon conference on the topic of Mr. Shortt’s practice. The video game industry is in constant expansion. Within Canada in particular, the industry is booming. Not only does the market create new forms of entertainment for us to enjoy, it creates jobs and generates staggering revenues which have grown from $10.1 billion in 2009 to $24.5 billion in 2016. The intellectual property tied to these products, whether the software or the packaging requires adequate and adaptive legal protection. Me. Shortt, will lay down the basic principles of IP as it relates to the industry, both in terms of copyright and patents. What are some concrete examples of IP issues? How has Montreal’s video-game industry evolved to face industry challenges and where is there still room to grow? The event will feature a presentation by Me. Shortt, followed by a round of questions students may have! Michael Shortt is a lawyer and trademark agent whose practice focuses on litigation and transactional work, with an emphasis on the video game and artificial intelligence industries. As a part of this work, Me. Shortt drafts and negotiates a range of intellectual property licenses and video game publishing contracts. He has developed a network of clients who require a lawyer that understands the particularities of cutting-edge technology and can provide them with the insight they require. Me. Shortt has always had a passion for the video game industry, which is particularly present in Montreal. This passion for the industry has led Me. Shortt to become the co-founder and Chair of Fasken Martineau’s video game industry group which helps development studios and publishers grapple with licensing issues and to comply with consumer protection regulation.